Dancing In Gumboots is an intimate portrait of a bygone era on the coast, telling the tales of bold and inventive women arriving to the Valley in the ’60s and ’70s. Jane Wilde and Monika Terfloth are waiting for me at a patio on 5th Street. Not far from here, Terfloth once stocked shelves at a discount store upon arrival to the Comox Valley in 1973. 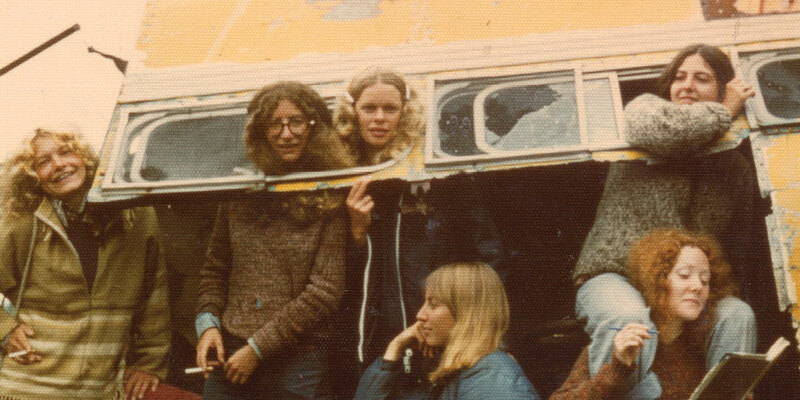 Wilde flips through a copy of Caitlin Press’s cult-hit book Gumboot Girls: Adventure, Love & Survival on British Columbia’s North Coast, showing me a photo of a row of seated women taken in Prince Rupert in 1977. A beaming Terfloth sits in the middle. While Gumboot Girls (which contains a story from Wilde about moving west from Ontario) focused on the area between Haida Gwaii and Prince Rupert, Dancing in Gumboots is specific to the Comox Valley. Though the location where the two women first landed differs, their motivation for leaving home was the same. The women describe an exotic mecca drawing them West, away from the stifling security of their families. A roaring ocean with a temperate climate, fresh air, fresh seafood, and fresh fruit, and a rugged environment they could test their youthful energy and fortitude against. They acknowledge that not everyone had the same positive experiences they did, and many stories in the book are bittersweet. But when I ask if remote British Columbia was everything they expected it to be, they respond in near unison that it was even better. “I couldn’t believe how lucky I was to be there,” Wilde says of Haida Gwaii. A childhood friend of hers was building a sailboat there, and enticed her with stories of adventure and a newfound community. Upon arrival she met a crew of educated, well-travelled American women who took her under their wing. “Those years were so good and so positive for me,” says Wilde. Terfloth nods, saying she never considered going back to Saskatchewan again. There are marked differences between the two compilations, and Dancing in Gumboots has a distinctly local flavour. Editor Lou Allison noted a consistent theme throughout, with vehicles factoring heavily into the contributions with an air of nostalgia. “I arrived in an old beat up truck… I arrived in an old beat up Volkswagen Van…” Wilde laughs. Terfloth herself arrived in a golden-tan home delivery milk truck that had a single driver seat for her boyfriend (now husband, Randy). She and a friend set up collapsible lawn chairs in the back, leaving the sliding door open to add exhilaration to the road’s curves. It still smelled faintly of sour milk. Wilde and Terfloth describe a thirst for knowledge that wasn’t previously available to them, sharing and devouring books like Spiritual Midwifery and Our Bodies, Ourselves —“Our Bibles,” says Wilde. They both recall a sense of liberating capability, with people building the rafters of houses or installing electrical wiring with only instructions in a manual to guide them. Wilde, who has relocated to the Comox Valley herself, says that only 11 of the 35 contributors to Gumboot Girls still reside in the North, while 29 of the 32 women who contributed to Dancing in Gumboots still call the Comox Valley home. They note that many women in the latter category stayed here to make significant contributions to the Valley that are still evident today, through community development, activism, environmental enrichment, and political involvement. Both Gumboot Girls and Dancing in Gumboots are unique in the publishing world, as the stories weren’t traditionally curated. Instead, they used the first 35 stories they received, and edited them with a restrained hand to maintain each individual’s voice and personal nuances. 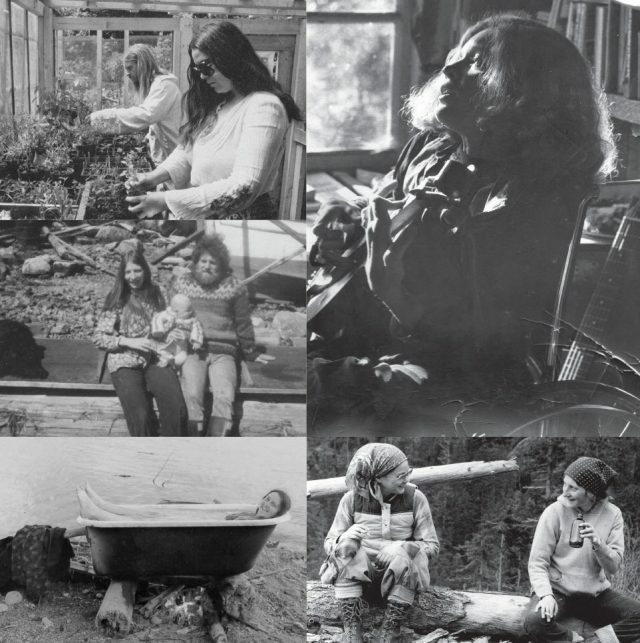 The result is a refreshing, inclusive, and meaningful picture of an era in the Valley’s history when the ideal community these women envisioned felt within their reach, and they had the determination and resilience to achieve it.